We look forward to seeing you on the MacDonald Pass ski trails, just 15 miles west of Helena, where fourteen kilometers of groomed classic and skate cross country ski trails (map) await your kicking and gliding. The Nordic ski trails on Mac Pass are open, snow permitting, December through April. To make the most of an often shallow snowpack, the Last Chance Nordic Ski Club, in cooperation with the Helena National Forest, grooms these popular (see MacDonald Pass statistics) cross country ski trails almost daily. As a result, cross country skiing is usually great. There’s no charge to ski, although skiers are encouraged to join the Club or make a donation to help defray grooming costs. You’ll find a plowed parking lot on the north side of Highway 12, about one-third of a mile east of the highway summit. Please park considerately and don’t block the gate to Frontier Town. A toilet is located about one kilometer (0.6 miles) down the trail, near where the Access Trail intersects the Microwave Road Trail. Please do not walk your dog, ride bicycles, or use snowshoes on the trail. These activities churn up the carefully groomed surface and make nordic-style skiing difficult or dangerous (see LCNSC’s Trail Use Guidelines). Thank you for your cooperation. Click on image to download map. 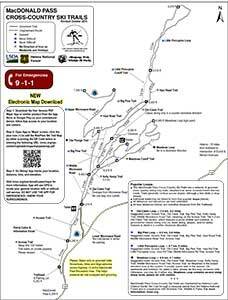 See Maps page for mobile app info. I drove up to MacPass this afternoon to check on conditions. There was a lot of new, wet snow but the snow wasn’t slushy like we have in town. I took the roller over the core trails and upper Microwave a couple of times to pack the snow down. I also tried to set classic track but got stuck as soon as I started. The classic skiing was good this afternoon. The skate lane will set up this evening and conditions could be good tommorow morning. Helena’s KTVH television station featured Emmett and Larry on Mac Pass, extolling the virtues of our lovely groomed nordic trails. It’s a great interview; Emmett and Larry made us all look good. The Battershell family owns the property formerly known as Frontier Town behind the gate above the trailhead parking lot. They have posted their property against trespass—their right as a property owner. Unfortunately, despite the fact that it is prominently posted against trespass at the trailhead, in the past week or so, somebody entered the property from the trail and was seen on security cameras wandering through the property..
Jeff Battershell has for many years taken care of plowing the parking lot at Mac Pass so that we can park in close access to the trailhead. He is under no obligation to do so, and if we had to secure that service from elsewhere, it would put a serious dent in our cash reserves. The Battershells have been a good neighbor to the ski club an d the trails. As a result of this, we have agreed to assist the Battershells in posting no trespassing signs in a few places along the trail between the trailhead and the cabin. While I suspect that people on our listserve are not the problem here, please respect the Battershells’ private property and stick to groomed trails as you head out toward the Microwave Road. Snow on Mac Pass—and the possible prospect of more tomorrow—has thrown a wrench into this weekend’s planned trail work. So if you were planning on joining at the Pass this weekend (Oct. 13 and 14), don’t. If any of you have time during the week to put in a few hours, contact Stan Bradshaw (bradshaw@mt.net) and Cliff Sheets (cliff.sheets@outlook.com) as we may put in a few hours this coming week to do some trail work, and we can always use some extra hands. Greetings, fellow Nordic skiers. With fall in the air, winter is not too far behind. While a small group of volunteers has worked to install snow fences in critical areas, we still have a fair amount of off-season trail maintenance (weed-whacking, rock picking, etc. )work to complete before the general hunting season starts on the weekend of October 20. In order to finish that work off, we will be hosting two volunteer days on Saturday and Sunday of this coming weekend (October 13 and 14). We will meet at the parking lot at the Mac Pass trailhead at 9:00 am on each day. So come and join us. Bring some gloves, water, food, good walking shoes (boots would be best—it’s pretty wet in places), and help get the trails set for winter. Possible tools to bring if you have these would be heavy pruners or a heavy-duty weed whip (and extra string or blades).